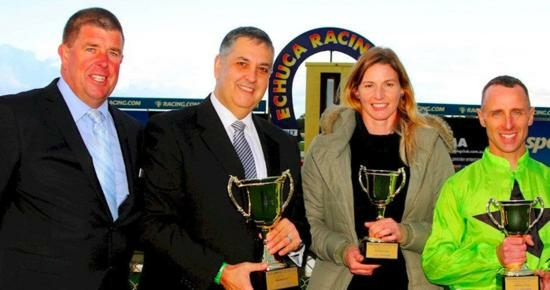 There would be no miracle repeat following Daryl Archard’s first Echuca Cup win in 2016. The 2017 Echuca Cup – run and won at Echuca Racecourse yesterday – has not only left town, it has gone overseas. With Tasmanian trainer Imogen Miller and champion jockey Brendon McCoull after their horse Tshahitsi blitzed the field in the $80,000 Moama Bowling Club Echuca Cup over 1400m. It was always going somewhere because no local trainer had a horse qualify for the event after Leveraction, Archard’s 2016 winner, retired. Champion Tasmanian jockey McCoull came over for today’s ride and was returning to Tasmania this morning.